Published on February 9, 2009 in figma and Figures. 0 Comments Tags: figma, upcoming. Image from a post by gits_sac at dannychoo.com. Looks like we’re getting Summer Clothes Haruhi figma and Shikabane-hime figma, and a Strike Witches PVC. 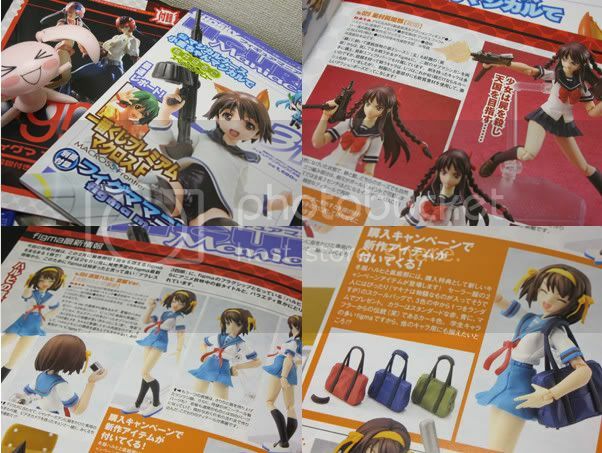 Looks like Haruhi will either come with a bag or is promoting figma school bags. It also looks like she will come with a digicamera, not to be outdone by Kyon’s camcorder. Shikabane-hime looks to come with a SMG and her braids look to be posable as well! We will defeinitely be keeping you posted!